M1TM Series. Body-Sensitive Magnetic Pickup. Acoustic Guitar Gold Award. The M1 is for players who love big acoustic tone with high feedback resistance on any stage. Combining the natural characteristics of your guitar’s soundboard with a punchy string attack, the M1’s body-sensitive design provides enhanced realism while cutting through a loud mix. 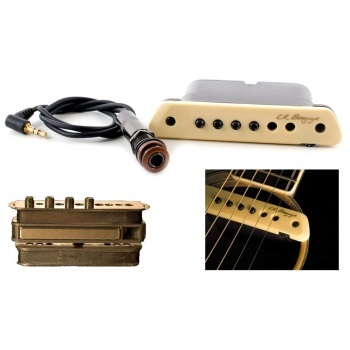 Body-Sensitive Design The M1 is a patented humbucking pickup with a twist. In a common stacked humbucker, the lower coil cancels hum, but doesn’t contribute anything positive to the sound. We unlock the lower coil with a carefully tuned support that allows it to capture higher frequency resonances. As the pickup moves with the guitar’s soundboard, a body signal is created in the suspended coil that adds presence and realism to your amplified sound.